Hello, friends. How are you all? I hope you to be fine. Many people commenting,"we are blogging. But getting no results." 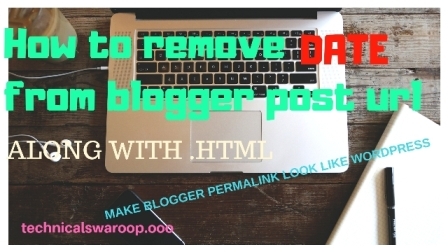 You asked me that how I am able to maintain so many blog and bringing traffics?" In this article you will learn "My Secret Blogging Strategies". And the strategies I follow while blogging. After a fix period of time, it gives me result. 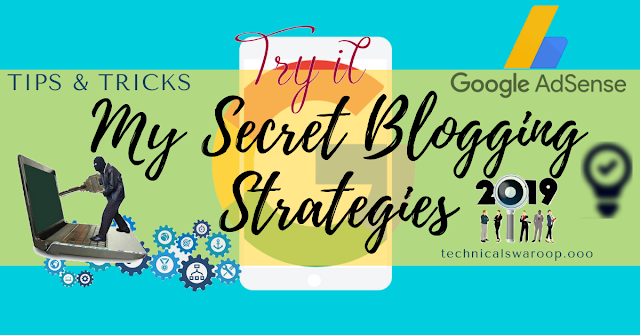 If you will follow there special blogging strategies. Then definitely you will get result. But I think 95% of you can't follow it. So, today we will learn all this blogging strategies. Hallo friends i am Swaroop and welcome to Technical Swaroop. I follow many blogging strategies strictly. What shall I say? One my adsence rules is not to take first payment. When i got a new adsence approve. First payment either given to contributers or spend on friends. I never keep my first payment from adsence. Because of a secret reason. You will came to know later. I follow having many strategy. Today, you will learn my secret blogging strategy. Follow blogging strategies from creating a blog to earning from it. These blogging strategies will give you positive result. After following these strategy, if result will negative. Then tell me. After decided to blog on a topic. completely research the topic. How to research? To research on a topic. Visit other's blogs on that topic. Analyze their title, keywords, meta-tag, format, color, text size, etc. Also find their traffic and keywords they cover. Through the process of researching, collect these things- blog titles, keywords, article titles, 10-15 articles, meta-tags. Now buy domain and hosting. These days, I am not using shared hosting. I use speed server like cloud hosting. If shared hosting is used. Then your blog is not going to rank. Only, due to it's speed. Many people run for cheap hosting. But wise will choose good hosting. If you don't have money to buy hosting. Without tension go to Blogger. Blogger provides top label hosting. That's too for life time free. After buying a hosting. Buy a domain. First choice is .com. .Net is my second choice. if required domain is not available then go for .in, .us, .online, .website .co, .cc etc. Next, install WordPress and search for themes. Analyze other websites in your niche. What type of layout they have used? Then design a completely different theme from your competitor. It has two reason : First Google will think this website is something new. Second is visiters can remember the site. Now, Blog is setup. Now, make social media pages. Then, connect them to blog. Also setup Auto post and all other thing. All there work are done in a private mode. I don't allow search engine to crawl my blog. You can do this in setting. Here one benefit you will get. That is even if your blog have no post. Then also google will crawl your blog and get wrong data. When I see my website is completely build. Then I enable crawling. Now I have completed blog. To setup a blog maximum I take 3-4 months. Minimum it take 1 month by hiring content writers. In this time i target 100 posts. Post mean high quality post. At least your post should be understand by your views. Your visiters should get what he want in your post. Many people asked article should be of how many words? My answer: It depend on you topic and competitor. After 4 months blog is 100% done. By 5th month all 100 articles will be in Google. Now time of adsence applying. If you will be rejected. Then it's God's foult. This's just a joke. Why adsence will disapprove? Adsence say 'this that' violation. That is just nonsense. you will get adsence approve. 20-50 post you will get not much visiters. At last let Google know you are as serious blogger. Google will choose the best for first position. Ok bro. Tell me in comment which of my rules you like. Do you have any rules(strategy) like me.